The top theatre outside of the capital over the past 12 months. Theatres in the UK’s nations (Northern Ireland, Scotland and Wales) are also eligible. Judged on criteria including (but not limited to) artistic quality, business success, innovation. The last 12 months has seen Nottingham Playhouse  re-energised. 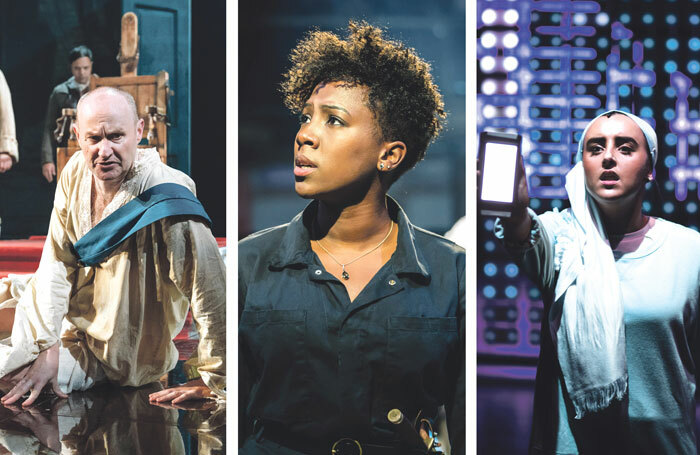 Under the leadership of chief executive Stephanie Sirr  and new artistic director Adam Penford, the theatre has not only enjoyed an increase in ticket sales and an audience growth of 10.5%, it has been revitalised creatively. Penford’s first full season included a revival of Beth Steel’s mining drama Wonderland , Matthew Xia ’s production of Mufaro Makubika’s Alfred Fagon award-winning play Shebeen , about the city’s race riots; Holes , the first in-house family show on the Playhouse’s main stage in years, and a slick production of 1960s musical Sweet Charity , featuring a dazzling performance by Rebecca Trehearn . Most recently, Penford directed a revival of Alan Bennett’s The Madness of George III, starring a superb Mark Gatiss in the title role, which was broadcast by National Theatre Live . Local company Fifth Word staged James Fritz’s Lava , a timely new play about grief, in the Neville Studio. Xia was recently appointed an associate artist along with playwrights James Graham and Amanda Whittington. Part of the Ramps on the Moon  consortium and a partner on the Open Door initiative , Nottingham Playhouse has displayed a commitment to work that engages with and reflects the region’s communities while making the theatre a destination venue, putting it firmly back on the map. Not only did Manchester’s Royal Exchange  win this category in 2016, it was also shortlisted for the 2017 awards, reflecting the continuing excellence of the work being created. Under the artistic directorship of Sarah Frankcom , the standard of programming remains impressively high. The theatre began the year with Kendall Feaver’s moving new play The Almighty Sometimes , a debut work by the young female playwright, in the main space – a statement in and of itself. Director Katy Rudd went on to win best director at The Stage Debut Awards  and Feaver’s play picked up the UK Theatre award  for best new play. Frankcom directed her regular collaborator Maxine Peake in Beckett’s Happy Days  and Don Warrington in an atmospheric Death of a Salesman . Jade Anouka took on the title role in Queen Margaret, placing one of Shakespeare’s key female characters centre-stage. Mountains: The Dreams of Lily Kwok  was the result of a partnership between Yellow Earth  and Black Theatre Live , Peake’s Queens of the Coal Age  told the story of four working-class activists during the miners’ strike, and RashDash ’s Three Sisters  ripped into Chekhov and the male-dominated canon. It went on to win best touring production at the UK Theatre Awards. Black Men Walking , a co-production between Eclipse  and the Exchange, also toured to acclaim. Community engagement remains central to the Royal Exchange’s ethos and this autumn it presented six new plays by Chris Thorpe , inspired by and performed in six surrounding towns. Three of the theatre’s 2017 productions have been staged in London this year, while the excellent work of its young company continues to impress. It been a pretty remarkable year even by Theatr Clwyd ’s standards. Under artistic director Tamara Harvey  and executive director Liam Evans-Ford, the north Wales venue has staged 13 in-house shows and programmed new work by some of the most exciting voices around. The Assassination of Katie Hopkins  was a case in point, a bold piece of commissioning. The social media satire by Chris Bush  and Matt Winkworth was one of the most ambitious new musicals of 2018, something cemented by its win at the UK Theatre Awards. The theatre also premiered Laura Wade’s Home, I’m Darling  in a co-production with the National Theatre. A West End transfer is on the cards for January. It also staged its first site-specific immersive show, the Guild of Misrule’s version of The Great Gatsby , as well as Emma Jordan’s all-female production of Lord of the Flies , a co-production with the Sherman Theatre in Cardiff. Clwyd’s partnership with new writing company Paines Plough  continued with three new plays by Vinay Patel , Simon Longman  and Georgia Christou performed in the company’s pop-up Roundabout space by a company of three, one of whom, Katherine Pearce, won The Stage Edinburgh Award  for her performance. As part of Theatr Clwyd’s writer in residence programme, three new Welsh-language writers  were also given an attachment to the Roundabout season. Welsh-language work is central to the theatre’s identity and the creative engagement team has done incredible work with the community in north Wales.